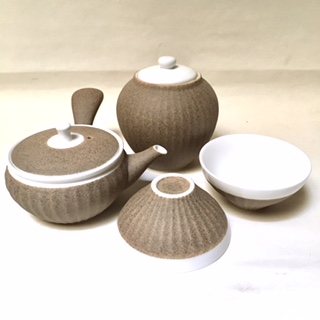 4 piece delicate white porcelain tea set with contrasting sand finish including matching tea jar. Teapot has built-in strainer. 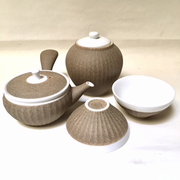 In traditional Kung-Fu style design, a small teapot is to make a strong tea to sip in little tea cups, similar to the style of serving Espresso coffee in small cups.